Update: It appears we were right. A leak from the Disney shareholder meeting in 2016 suggests that Luke's first words to Rey are "Who are you?" which renders most of the Skywalker family links redundant." This could of course be a fake out OR it could be that Luke doesn't recognize his daughter due to age. First up, we think that fans are being set up in The Force Awakens to believe that Rey is the daughter of our favourite bearded Jedi, Luke Skywalker. Here's some reasoning why Rey is the daughter of Luke Skywalker. It's loose but does give food for thought. The first point is that they have shared similar circumstances. We first met Rey in TFA as a woman who is stuck on a desert planet just wishing she could leave but is held back by the promise that her family to Jakku will return for her. Luke couldn't leave, he's stuck on the sun burnt sand plain of Tatooine as well, with the promise from Uncle Owen of leaving after 'next season'. Their tales start basically begin the same. They set forth on a journey making new friends and learning about the Force as they go. Ultimately they meet each other at the top of an island where Ray attempts to hand over Luke's long lost saber to its owner. This is actually a key theme of the movie. It would seem Luke is set to teach Rey how to become a Jedi but the question we're all asking, is Rey Luke's daughter? Recall The Empire Strikes Back where Luke enters the cave to find Vader approaching. Luke experiences a Force moment where he learns that he could become Darth Vader himself i.e. turn to the dark side of the Force. 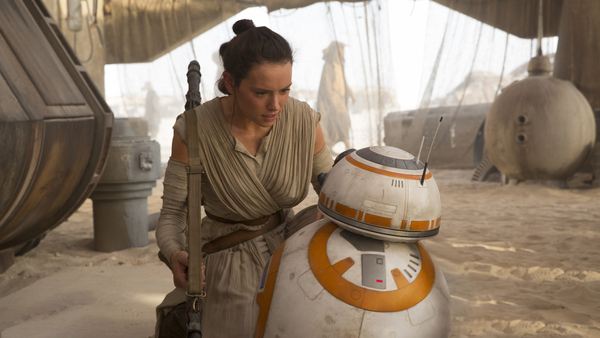 In The Force Awakens, Rey is lured down to the lower bowels of Maz Kanata's castle to find the lightsaber that has been deliberately placed for her. She has her own moment with the Force, arguably her personal Force awakening. This moment is so similar to Luke's experience, we wonder if the connection is deliberate. Speaking of Maz, she is Rey's Yoda like figure so when she tells Rey the lightsaber is calling her, you have to wonder why a saber who's previous two owners were Skywalkers has chosen to divine to her. Is it a family heir loom? The voices rey hears in her flashback vision are those of Yoda and Obi Wan - both are prior teachers of Luke. It's like they are watching over her, knowing she is going to have a big role to play. At her arrival on Echc-to Island, Luke seems to be wholly aware of who Rey is. Is this because he recognises his daughter? Her vision seems to suggest to her Luke's current whereabouts. There are some more minor points to consider. Both Luke and Rey (and Anakin Skywalker) are known as fine pilots. Rey demonstrated this when she flew the Falcon in the down Star Destroyer, Luke with taking down the original Death Star and Anakin many times! Is Rey's skill as demonstrative of being of Skywalker lineage? Rey also has a clear mechanical aptitude. Luke was no mug with a spanner, nor Anakin. Rey seems to have an interest in rebel pilots. In her AT Walker home she has a rebel pilot doll and appears to relax wearing a fallen Rebel's fighter helmet (the novelisation does suggest this was a learning device for piloting simulation). Does this attachment suggest a link to Luke? We think it's a deliberate red herring from the writers. At key moments, such as the saberfight between Rey and Kylo, 'Luke's theme' or leimotif can be heard. Does this suggest a familial connection? Luke doesn't say a thing in the movie - but he did in the 2nd trailer where he appeared to be telling some one in his family that they had the Force. While that was strictly for the teaser and not in the film, it could be argued he Luke was having a father daughter chat with Rey. Speculative at best, we know and it could just be another red herring by JJ and Kasdan. There are other theories too - Rey could be a Kenobi or a Skywalker. Perhaps she is from a completely new family. We'll explore those another time. Key Ren seems to know what's going on as at one point he exclaims to her face "it is you" as if he knows her story. Indeed one could argue that he was the one who left Rey on Jakku but that's not part of this discussion. Either way, we as the viewer have no confirmation of Rey's parentage and will have to patiently wait until The Last Jedi comes out. I really dôn't think about Rey being a kenobi but sure a Skywalker ! It's way too obvious (i hope). But as Lucas not the scriptwriter and Disney didn't follow what he wanted, we never know what they planned. I'm sad wthey didn't followed the original story with luke and mara jade, ben Skywalker and all the solo kids.